Ten university teams were selected for the competition, which challenges finalists to design and build hardware that can identify, map and drill through a variety of subsurface layers, then extract water from an ice block in a simulated off-world test bed. The challenge seeks to advance critical capabilities needed on the surface of the Moon and Mars. Looking to build upon its success in the first two challenges, WVU’s Mountaineer Ice Drilling Automated System – or MIDAS III – hopes to again find itself in the winner’s circle. MIDAS I finished first in 2017 and MIDAS II finished second in 2018. According to Klinkhachorn, this year’s teams will have to go through multiple overburden layers with different hardness. They will also have to prospect the different layers in addition to extracting water from the ice layer. The 2019 team will again be led by Bertrand Wieliczko, an electrical and computer engineering graduate student from Holderness, New Hampshire. Also returning from last year are Jacob Winokur (aerospace engineering; Chesapeake, Virginia), Karan Kermit Sah (aerospace engineering, Lexington, South Carolina), Nathan Owen (mechanical engineering, Fairfax, Virginia), Derek Roesch (electrical engineering, WVU Honors College; Nazareth, Pennsylvania). New additions to the team include John Bright (computer and electrical engineering, Honors College, Butler, Pennsylvania), James Jackman (computer science, Seabrook, Texas), Maura Wieland (electrical engineering, Carnegie, Pennsylvania), Joseph Yeager (electrical engineering, Honors College, Summersville), Ian Hostottle (mechanical and aerospace engineering, Williamstown) and Samuel Price (computer engineering, Honors College, Paden City). Joining Klinkhachorn as an advisor is Ilkin Bilgesu, associate professor of petroleum and natural gas engineering. Finalists were chosen through a competitive review of project plan proposals. The selected teams are invited to NASA's Langley Research Center in Hampton, Virginia, June 4-6, 2019, to represent their universities. While at NASA, teams will participate in an on-site technology demonstration, and the prospecting and water extraction competition. Judges include NASA engineers and researchers along with commercial partners from Honeybee Robotics and SpaceX. Joining WVU in the competition are teams from Carnegie Mellon, Colorado School of Mines, MIT, Northeastern University, Stevens Institute of Technology, University of Houston, University of Tennessee Knoxville and Virginia Tech. Northeastern is the defending champion. 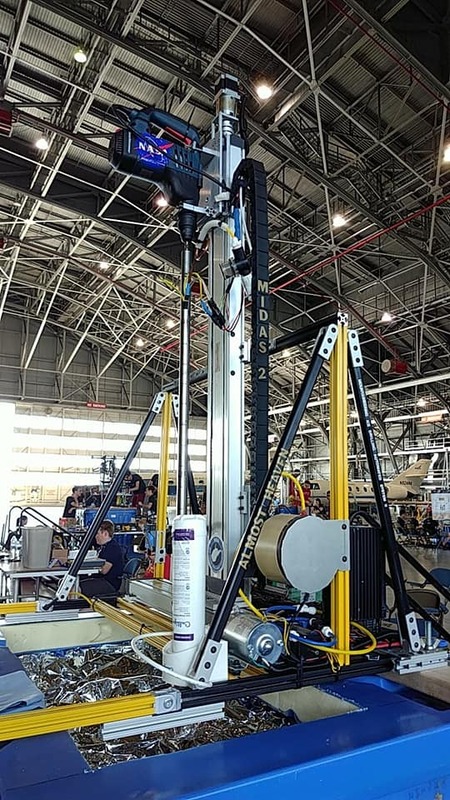 Armed with a $10,000 development stipend and lessons learned from previous competitors, teams now have six short months before going to NASA to build, integrate and test their prototype water extraction systems. Final scoring will be based heavily on their ability to drill through each layer of the simulated subsurface to extract and collect the water found in the ice. The team is sponsored by the Statler College of Engineering and Mineral Resources, the West Virginia NASA Space Grant Consortium, the Lane Department and the Department of Petroleum and Natural Gas Engineering.